A shocking photo has emerged of two former police officers posing with a suspect dressed as a hunting trophy. The picture was unsealed by a Chicago judge as one of the officers fired over the incident appealed the decision. The Chicago Sun-Times published the troubling polaroid on Tuesday, showing Special Operations Section (SOS) officers Timothy McDermott and Jerome Finnigan kneeling over an African-American man with deer antlers strapped to his head. It was taken sometime between 1999 and 2003. “Our residents deserve better than this, as do the thousands of good men and women in this department,” McCarthy added. Finnigan told federal investigators that the man in the photo had been arrested for having “20 bags of weed,” reported the Sun-Times. The hunting rifles were the suspect’s, Finnigan said, and the photo was taken in “the spur of the moment” at the Harrison Police District on the West Side. There was no report about the arrest, Finnigan told the FBI, because he and McDermott had let the suspect go. McDermott left the SOS in 2003, so he was not involved in the 2007 scandal that saw the unit disbanded and Finnigan and several others charged and convicted. Former police superintendent Phil Cline praised McDermott as a “very hard-working policeman, the type of policeman I wanted working for us and his character was impeccable,” according to the Sun-Times. 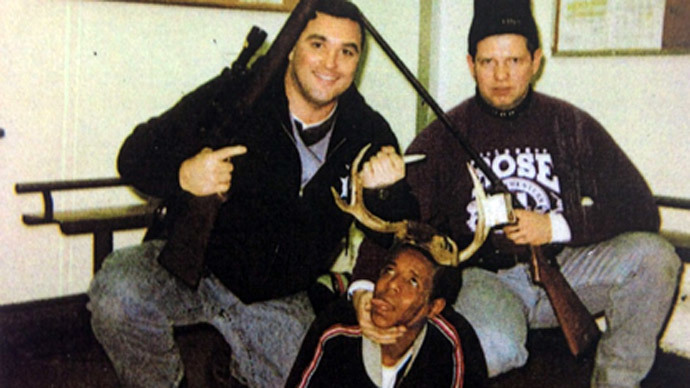 In a June 2013 interview with Internal Affairs Sergeant Michael Barz, McDermott remembered the photo, but not the time and place it was taken, or the identity of the man with the antlers. Court records obtained by the Sun-Times indicate McDermott, who earned 74 department awards during his career, was also involved in four federal lawsuits accusing him and other officers of misconduct. The three settlements and one jury judgment cost Chicago $162,000 in payouts, as well as “hundreds of thousands of dollars” in fees to the plaintiffs’ attorneys.